Adisa Au, 3, (right) watches a Lion Dance by Developing Virtue Dragon and Lion Dance Club at the Asian New Year celebration held at The Oakland Museum of California on Sunday, Feb. 12, 2017 in Oakland, CA. Photo by Paul Kuroda. 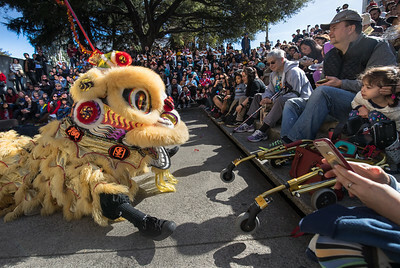 The Oakland Museum of California (OMCA) rings in the Year of the Rooster with a day of Asian New Year traditions on Sunday, February 12, 2017 from 12 to 4:30 pm. Featuring activities for the entire family, the 16th annual event celebrates the many time-honored traditions of diverse Asian cultures represented in California, including Chinese, Korean, Vietnamese, Japanese, Mongolian and other Asian cultures with an array of arts, crafts, food, demonstrations, live music, dance, martial arts, and more. 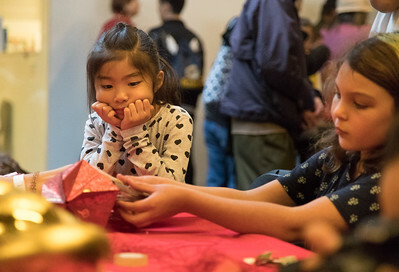 Cloris Zhang, 7, watches friend Brianna O'Connell-Sunnen, 7, staple her Chinese lantern at the Asian New Year celebration held at The Oakland Museum of California on Sunday, Feb. 12, 2017 in Oakland, CA. Photo by Paul Kuroda. The Oakland Museum of California (OMCA) rings in the Year of the Rooster with a day of Asian New Year traditions on Sunday, February 12, 2017 from 12 to 4:30 pm. Featuring activities for the entire family, the 16th annual event celebrates the many time-honored traditions of diverse Asian cultures represented in California, including Chinese, Korean, Vietnamese, Japanese, Mongolian and other Asian cultures with an array of arts, crafts, food, demonstrations, live music, dance, martial arts, and more. 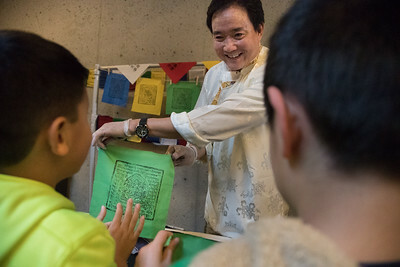 Myles Chen, 7, and Darren You, 7, clap when Jamyong Slingye show their wood block printed Tibetan Prayer flag at the Asian New Year celebration held at The Oakland Museum of California on Sunday, Feb. 12, 2017 in Oakland, CA. Photo by Paul Kuroda. The Oakland Museum of California (OMCA) rings in the Year of the Rooster with a day of Asian New Year traditions on Sunday, February 12, 2017 from 12 to 4:30 pm. Featuring activities for the entire family, the 16th annual event celebrates the many time-honored traditions of diverse Asian cultures represented in California, including Chinese, Korean, Vietnamese, Japanese, Mongolian and other Asian cultures with an array of arts, crafts, food, demonstrations, live music, dance, martial arts, and more. 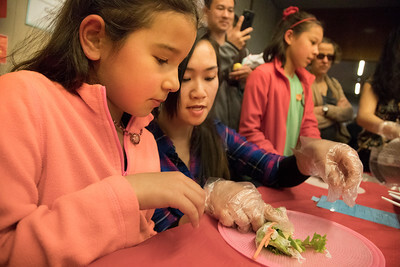 Elena Morishige, 8, makes Vietnamese spring roll with the instructions by Amanda Nguyen at the Asian New Year celebration held at The Oakland Museum of California on Sunday, Feb. 12, 2017 in Oakland, CA. Photo by Paul Kuroda. The Oakland Museum of California (OMCA) rings in the Year of the Rooster with a day of Asian New Year traditions on Sunday, February 12, 2017 from 12 to 4:30 pm. Featuring activities for the entire family, the 16th annual event celebrates the many time-honored traditions of diverse Asian cultures represented in California, including Chinese, Korean, Vietnamese, Japanese, Mongolian and other Asian cultures with an array of arts, crafts, food, demonstrations, live music, dance, martial arts, and more. 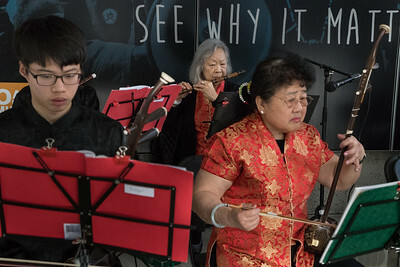 Michael Zhou, Marion Kwan and Kathryn Chong of the Dharma Realm Chinese Orchestra play at the Asian New Year celebration held at The Oakland Museum of California on Sunday, Feb. 12, 2017 in Oakland, CA. Zhou and Chong play the Er-Hu string instrument and Kwan is playing the Chinese Flute. Photo by Paul Kuroda. The Oakland Museum of California (OMCA) rings in the Year of the Rooster with a day of Asian New Year traditions on Sunday, February 12, 2017 from 12 to 4:30 pm. Featuring activities for the entire family, the 16th annual event celebrates the many time-honored traditions of diverse Asian cultures represented in California, including Chinese, Korean, Vietnamese, Japanese, Mongolian and other Asian cultures with an array of arts, crafts, food, demonstrations, live music, dance, martial arts, and more. Olivia Wen, 5, (red Chinese jacket) and Vonnie Liu, 4, (pink shirt) follow Gabrielle Oh lead of KPG Cal dance group at the Asian New Year celebration held at The Oakland Museum of California on Sunday, Feb. 12, 2017 in Oakland, CA. Photo by Paul Kuroda. The Oakland Museum of California (OMCA) rings in the Year of the Rooster with a day of Asian New Year traditions on Sunday, February 12, 2017 from 12 to 4:30 pm. Featuring activities for the entire family, the 16th annual event celebrates the many time-honored traditions of diverse Asian cultures represented in California, including Chinese, Korean, Vietnamese, Japanese, Mongolian and other Asian cultures with an array of arts, crafts, food, demonstrations, live music, dance, martial arts, and more. 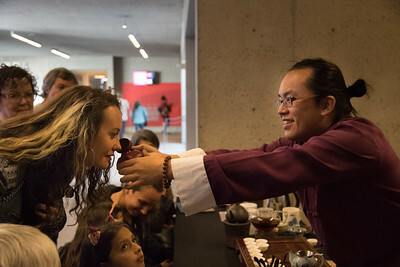 Kenny Chew, co-founder of Fabula Teas, invites Sofia Sharpe to smell a tea at the Asian New Year celebration held at The Oakland Museum of California on Sunday, Feb. 12, 2017 in Oakland, CA. The Oakland Museum of California (OMCA) rings in the Year of the Rooster with a day of Asian New Year traditions on Sunday, February 12, 2017 from 12 to 4:30 pm. Featuring activities for the entire family, the 16th annual event celebrates the many time-honored traditions of diverse Asian cultures represented in California, including Chinese, Korean, Vietnamese, Japanese, Mongolian and other Asian cultures with an array of arts, crafts, food, demonstrations, live music, dance, martial arts, and more. 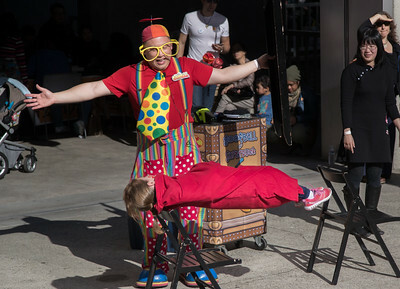 "Goofball" a magician suspends Gwyn Moore, 8, at the Asian New Year celebration held at The Oakland Museum of California on Sunday, Feb. 12, 2017 in Oakland, CA. The Oakland Museum of California (OMCA) rings in the Year of the Rooster with a day of Asian New Year traditions on Sunday, February 12, 2017 from 12 to 4:30 pm. Featuring activities for the entire family, the 16th annual event celebrates the many time-honored traditions of diverse Asian cultures represented in California, including Chinese, Korean, Vietnamese, Japanese, Mongolian and other Asian cultures with an array of arts, crafts, food, demonstrations, live music, dance, martial arts, and more.